Chevrolet recently unveiled a few impressive Silverado concepts at this year’s annual SEMA Show, all of which were quite unique. From a Carhartt themed work truck, to a beach-worthy surfer pickup, Chevrolet covered all the bases when it came to making a Silverado for every possible occasion. While the Carhartt and surf-ready Silverado pickups aren’t available to purchase at Albany car dealerships just yet, there are plenty of impressive special edition Chevy trucks ready and waiting for you to discover, right this very minute. The Chevy Silverado pickup that so many truck enthusiasts have come to depend on, has been gracing the streets of America since 1987. It wasn’t until 2004 that Chevy introduced its very first special edition Silverado pickup, which was designed with plenty of upgrades not yet available on Silverado 1500 models. The second special edition Silverado was released in 2004 and was known as the Intimidator SS. The Dale Earnhardt Inc. licensed pickup was designed in honor of the late racecar legend, and featured various aesthetic upgrades including custom badging. Once the Intimidator SS hit the market, Chevrolet began a tradition of engineering and designing special editions of the Silverado pickup that would become incredibly popular over the years. Fast forward to 2016, and the bowtie brand has a slew of worthy pickup truck contenders on its roster, including three that we can’t help but be overly impressed with. Whether you need a truck to conquer your outdoor excursions, deliver you in style for a night out on the town, or take to the track this racing season in Indy, there is a Silverado that is perfectly suited to match your needs, and exceed your expectations. First up on our list of must-see Silverado special edition models, gives a special nod to the past of Chevy pickup special edition trucks. The Rally 1 and Rally 2 versions of the highly capable Chevy Silverado are two special edition models that beg to be taken out on the track. 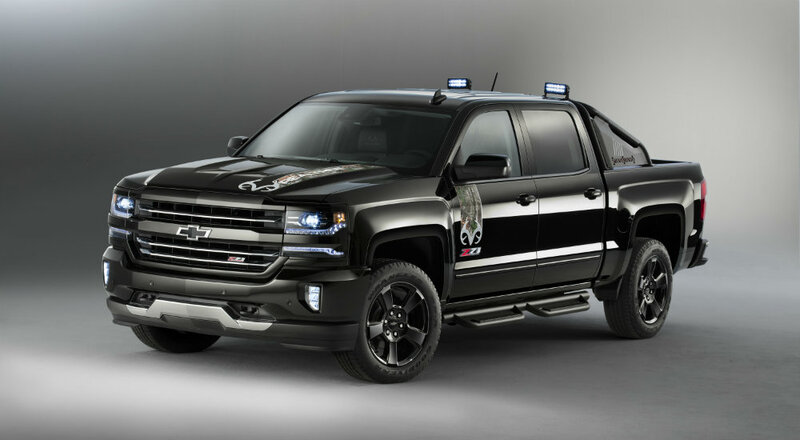 Featuring exterior enhancements like custom rally striping and black Chevy bowtie emblems, you can be ready for a day down at the NASCAR track, by arriving in ultimate style only available on the Silverado Rally special edition pickups. The Rally 1 model features side and front hood striping, 20-inch black wheels, and an available double cab. The 2017 Rally 2 Silverado pickup truck boasts larger 22-inch gloss black wheels, 4-inch round assist steps, that same iconic striping as the Rally 1, and can be purchased in either a double or crew cab body style. Regardless of which of these trucks you end up taking home, you certainly will not be disappointed. Whether you are an outdoor sportsman who enjoys hunting and fishing, or simply have an appreciation for nature and regularly spend your free time in the upstate New York wilderness, the Silverado Realtree special edition is a real dream come true. Realtree is an outdoors hunting show that has aired in the United States since 1993, and that crew shares the same thirst for adventure and outdoor exploration that so many Silverado drivers do. Chevrolet teamed up with Realtree to create its most outdoor worthy truck ever made, and for hunters and adventurers alike – the Silverado Realtree model is the best version of a pickup available on the market. Featuring a jet black exterior with Realtree exterior graphics, the Silverado Realtree edition is ready to hit the off-road trails of America and be the vessel that delivers you to your ultimate outdoor adventure. Buyers can opt for either the 1500 Crew Cab LTZ or Z71 model, which includes enhancements that will outfit you for whatever excursion you have in mind for the day. The exterior camouflage graphics and black exterior bowtie emblems give an immediate sense of what this Realtree special edition is all about, and that same theme is brought inside the cabin with embroidered head restraints and camouflage accents. The all black leather interior gives this special edition Silverado model a touch of luxury, while black off-road assist steps and Rancho shocks help deliver the ultimate comfort and utility on the off-road trails of America. The third and final special edition Silverado that we will highlight today, is the Special Ops edition of Chevy’s iconic pickup truck. Inspired by the United States Navy, the Special Ops Silverado is arguably the most capable version ever created. In a partnership with the Navy SEAL Museum located in Fort Pierce, Florida, every Special Ops Silverado that is sold helps families of injured, fallen, and active duty military through the Trident House Charities Program. This American-made truck is doing its part in helping the brave men and women who fight to keep us safe each and every day, and we can’t help but love everything that it represents. Completely outfitted with unique features from the ground up, the Silverado Special Ops is easily the most unique model of the truck to ever hit the market. Featuring 20-inch black aluminum wheels, deep tinted windows, black bowtie emblems, and custom Naval inspired exterior graphics, the Special Ops Silverado is undeniably made in support of the U.S. Navy. A bed-mounted sport bar featuring a Special Ops signature logo, sport assist steps, all-terrain tires, and a spray-in bedliner, all come together to turn this special edition Silverado into one of the more capable pickups on the road. Whether you are a proud member of the United States Navy, have a family member or close friend who has selflessly served our country, or simply want to support the men and women who fight for our freedom, the 2017 Silverado Special Ops truck is the perfect way to emulate all three. If any of these special edition Silverado pickups intrigue you, or you are interested in learning more about the other unique trucks available in the Chevy lineup, we invite you to come down to DePaula Chevrolet and discover these capable pickups in person. With so many options to choose from, the only way to find which one is the right choice for you, is to get behind the wheel and take each of these trucks for a test drive. Be sure to stop by Depaula Chevrolet in Albany, New York, and see these exceptional Silverado models for yourself.